Learn how to turn your backyard into a fantastic birding haven with this BestNest Basic Birding Booklet Bundle. 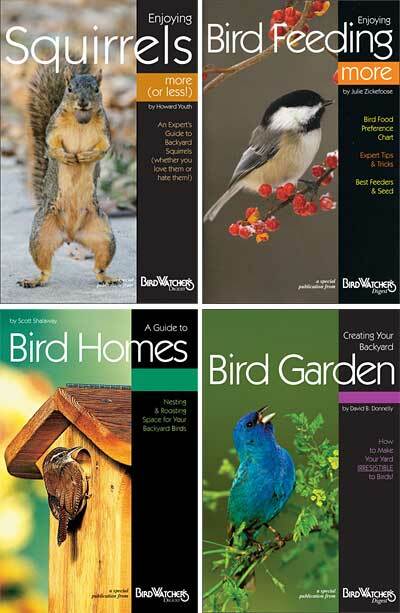 This set of four paperback booklets brings a wealth of information to your fingertips, helping you establish a bird garden easily. The bird feeding book not only explains the different, common feeders available; it also notes what birds prefer what type of seed, placement ideas, and any important accessories for an avian dining spot. The bird house book provides similar information on shelters, including where to place them and how to protect your feathered friends from predators. Use the included bird gardening book to determine which avian-friendly plants may thrive in your area, to better attract these animals into your yard. Bird gardens often pique the interest of neighborhood squirrels, so the squirrel book has a wealth of tips on how to deter or welcome these visitors. Each work offers clear information, plenty of photographs and illustrations, and is simple to read, for a fantastic addition to your library. Welcome several birds into your yard with your newfound knowledge from this Basic Birding Booklet Bundle.